Now that we have a reasonably working Abilities block, let’s take a stab at a slightly more challenging section of the Stat Block, the Hit Points. Hit Points represent the “life force” of a creature, so to speak. Mechanically, this is how much damage a creature can take until it dies, and is expressed in dice rolls (2d6 for a Goblin), and a default average number, if one doesn’t want to roll the dice (7 for a Goblin). 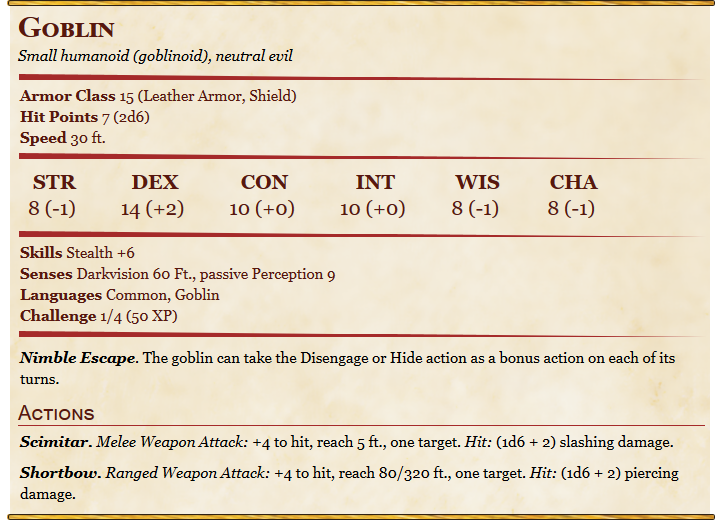 What this means is that, when creating a Goblin, you could either give him 7 hit points, or roll and add 2 6-sided dice, which would result in hit points between 2 and 12. Things can get a tad more complicated - for instance, Constitution influences hit points. A creature with high CON will get a bonus (more on this later), resulting in expressions likes 4d10+8, which translates to roll 4 10-sided dice, sum them, and add 8 to the result. Beyond Hit Points, dice rolls play a central role in D&D, and show up everywhere (see for instance the Hit description for the Goblin’s Scimitar and Shortbow, under Actions). We need a reasonably general way to model them. One fun aspect of D&D is its usage of uncommon dice shapes. Besides the iconic 20-sided dice, dice rolls involve 4, 6, 8, 10 and 12-sided dice. Source: Scott Ogle / Wikimedia. Side note: I will use “dice” for both singular and plural forms. My apologies to the purists! The mechanical resolution of situations in D&D involves rolling different types of dice and adding them together, potentially in combination with numbers / modifiers, as in 4d6+2d10+8. 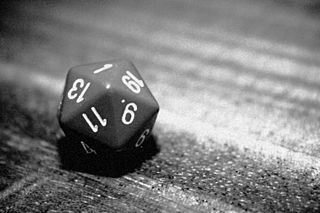 We can now create dice of any type: let myD8 = D 8. // val it : string = "4d6+2d10+8"
From a mathematical standpoint, this definition of the average is intriguing. 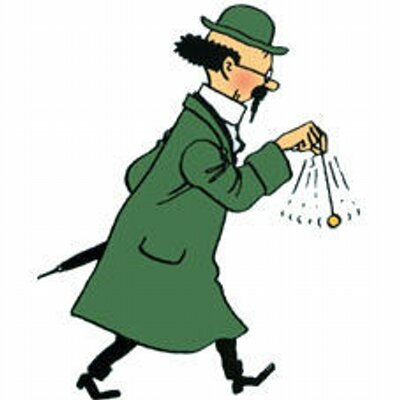 A typical definition of the average gives 3.5 for a 6-sided dice. However, D&D is purely integers based, and rounds down by default, hence our implementation. As an interesting side-effect, average 2d6 is not equal to average 1d6 + average 1d6! Compared to the way rolls appear in D&D, our expressions are a bit heavy-looking. The main reason is that, as a list can contain only items of one type, we cannot mix-and-match rolls and integers, which we have to wrap in Value. We are now armed with a reasonable representation of dice rolls, time to go back to Hit Points! Hit Points = multiplier * dice type + bonus. The type of dice matches the creature Size, and the bonus is directly related to its CON modifier: bonus = CON modifier * multiplier. This is somewhat consistent with the rules driving character Hit Points, which are computed by adding their CON modifier to a certain type of dice (determined by the Class), and multiplying by their Level. There are also assymmetries here: Monsters do not have a notion of Level, and, unlike Adventurers, the type of dice used is given by their race, and not their Class, which isn’t defined. There are also a few other differences (maximum hit points at level 1, rounding up in average hit points calculation). In other words, while the overall logic is similar, there doesn’t seem to be an obvious way to compute hit points for Monsters and Adventurers in a consistent manner. First, reassuringly, our results match the Monster Manual. This doesn’t prove the code correct, but at least it isn’t blatantly wrong. Then, it’s rather nice to see how, once we are past the initial effort of modeling rolls by creating our own expressions, everything starts to flow nicely. We can now express fairly clearly how Hit Points are computed (monster.HitDice * hitPointsDice monster.Size + monster.HitDice * modifier monster.Abilities CON), the hit dice changes from Hobgoblin to Hobgoblin captain automatically propagate into the computation, and anywhere we encounter rolls, we should be able to reuse what we wrote.